You acknowledge and agree to your obligation to read the Agreement and all other policies and guidelines relating to the Services in entirety before proceeding with your use of the Services. This Agreement sets forth obligations, rules and policies that must be followed when using the Services, when receiving information from the Services, when interacting in any way with the content of the Services (including but not limited to with other users of the Services) and/or when engaging in any other activity or matter which may be relevant to use of the Services or otherwise with Company. You hereby agree to comply with the Agreement as a condition of any use of the Services and/or of any interaction with Company. In the event that you be legally incapacitated or otherwise unable in any way to be bound by this Agreement or be unable to fully agree and comply with the provisions of this Agreement for any reason, you are hereby required to discontinue any use or participation in the Services immediately. In the event of any conflict come between this Agreement and any other agreement or policy which may be found on the website of the Company or elsewhere in connection with the Company or the Services, this Agreement shall take precedence and shall prevail. The Company reserves the right to update or otherwise amend (either in whole or in any part) the terms and conditions of the Agreement without the need to provide any prior notice to you or any other users of the Service or any other party. In its sole discretion, the Company may send a notification of any amendment made to the Agreement through any medium the Company so chooses and deems appropriate to use. Any amendment to this Agreement shall be immediately binding and enforceable, and any further use of the Services after any such amendment constitutes conclusive agreement by you (the user) to the amendment as part of the Agreement. The Company also reserves the right to change, discontinue or remove any part of the Services without the need to provide any prior notification to you or any other users of the Services or any other third party. The Company provides services as part of a commercial enterprise with intent to provide a mutually beneficial experience for you and other users. The Services may include means and methods of challenging the skill and intellectual faculties of its users through skill-based puzzles, games and contests. No user with the intent to engage in the activity of gambling, or any variant is authorized to use the Services; any person or entity engaging in the activity of gambling shall be and hereby is required to discontinue use of the Services immediately. The activity of gambling is expressly prohibited. (No part or aspect of the Services are intended as a solicitation of or encouragement to the user to gamble, wager, use or otherwise incorporate actual money in their use of the Services.) The Company provides its Services (including but not limited to any and all information contained in this Agreement) or otherwise presented by Company only on a strict “as is” and “where is” basis. Any information provided by Company cannot be considered as expert advice to be relied upon for any purpose. You are hereby advised that any information provided in connection with the Services, including but not limited to any content, promotion, advertisement, message, videos, listings, advisories, interaction or comments presented by Company or found/displayed on the Services is provided on an “as is” basis. In no case and under no event shall the Company or the Services be held liable on account of your use or reliance upon such information. While the outcome of all games incorporated in the Services are primarily determined on the basis of user skill, there is no absolute guarantee that a more objectively skilled user will win such games, or that the probability of winning such games is increased by an increase in objective skill level. The element of chance is an inherent aspect of such games and something that cannot be ruled out absolutely. Each user therefore agrees to assume the inherent risk of a loss of any contest while using the Services; you and each user and hereby forever releases the Company and the Services from any liability in relation to any loss of any kind under any circumstances. The Company also does not warrant or guarantee the identity, authenticity or reputability of any of its users, including those users with whom you may have an interaction in connection with the Services. The Company does not warrant that its users will act in compliance with the Agreement or that such users will transact with you in good faith. Should you share or post any information or content in relation to the Services, or interact or provide information or content to another user of the Services, you shall be solely and fully responsible and liable for or in relation to such information; the Company shall have no liability or responsibility for any such information posted, published or otherwise provided by any user or other person. This sole responsibility of the user includes any and all forms of liability in connection with the information or otherwise relating to the information. You also agree to absolutely indemnify the Company and the Services from any direct or indirect liability that it may be exposed to as a result of any information or content which you may disclose, post or otherwise provide in any way including in relation to another user or otherwise in any relation to the Services or otherwise relating to the Company. You must be at least 18 years of age to participate in the games that are incorporated in the Services. If you are not at least 18 years of age, your use of the Services is absolutely void and prohibited but in any event you shall be subject to all terms and conditions of this Agreement and all policies and guidelines. Any use of the Services is also prohibited if you are legally incapacitated in any way or otherwise incapable of being bound by this agreement, or if you are prohibited from participating in games and/or contests per the laws of your jurisdiction. If your jurisdiction construes or interprets the games or any part of the games incorporated within the Services as either immoral or illegal for any reason, then you are and shall be prohibited from using or continuing use of the Services in such jurisdiction. Any use of the Services must be only in a direct capacity and, as such, you agree that you will not use the Services in a representative capacity. The Services also require that you possess access to the appropriate Internet connection and compatible device, and that said device meets certain device requirements, in order for you to enjoy its functions. The Services may be directly or indirectly affected by the configuration of your device, software and/or connection; you agree to hold full responsibility to establish and maintain configuration settings and/or address appropriate factors relating to your device, software and/or connection. The Company disclaims any liability for any perceived or actual substandard performance of its Services as a result of any inadequacy in or absence of these factors. You acknowledge that the Services may not operate as intended with all devices, software, systems, connections; you agree that you will discontinue the use of the Services if the Services are not properly operable on your device, software, system, connection. At any and all times, the Company reserves the right to determine, restrict or monitor users of the Services, and to determine in which jurisdictions and/or on which devices or software the Services shall be made available. The Company does not guarantee or provide warranties that the Services shall be available on a continuous basis, as there may be offline periods due to circumstances including but not limited to outages, disconnections, shutdown, routine maintenance, repairs, upgrades, viruses or any other conditions in control or not within the control of the Company or the Services. The Services are primarily intended to work within the jurisdiction of the United States. As a result, you acknowledge the possibility that the Services may not be available in for use in your jurisdiction or in the language of your choice; you agree that the Company and the Services are not liable for any issues and/or inconveniences that arise as a result. Before you are permitted to engage in the Services, it is absolutely required for you to ensure that you are not disqualified by your local jurisdiction from participating in the games incorporated within the Services. As a user of the Services, you hereby warrant and guarantee that you are not disqualified by your local laws or the laws of any jurisdiction that pertain to you from using the Services. You also agree that even if the Services are available or accessible to you in your jurisdiction, such an availability shall not be considered an automatic offer or invitation of use if the Services are considered illegal under the laws of your jurisdiction. In order to authenticate your capacity to freely and legally use the Services, the Company may require from you certain documents or other authenticating devices to prove that you are not barred by your local laws from using or accessing the Services, including, but not limited to, proof of residence or location. Should it be determined or discovered or otherwise that you have engaged in the Services in contravention of this Agreement and/or of your inherent legal limitations or any other limitations in accordance with this Agreement, you hereby agree that the Services may immediately discontinue your participation and revoke/remove any rankings, reputations or virtual information of any kind that you may have received or established within the context of the Services. The Services may only be used for the purposes set forth by Company. Users are permitted to engage in activity relating to the Services only for lawful, moral and legitimate purposes. Any unlawful, illegal or immoral use of the Services is absolutely prohibited. While using the Services or otherwise in relation to the services, you agree that certain acts and activity is prohibited and hereby agree to not engage in any of the following acts or activities: deceitful or fraudulent activity; any acts that can be characterized as gambling; building contact or business lists or participating in lead generation with the aid of the Services; placing any viruses, compromised files, content or any other hacking or code which may harm the Services on the system of the Services; use software or scripts on the Services; discriminating, bullying or maltreating any other user in any community; posting or spreading content which can be customarily considered as spam, phishing content, pyramiding content, chain mail or unauthorized contests with the aid of the Services; using or operating of any machine, vehicle or other equipment that will require attention; other improper or unauthorized conduct. In addition to not engaging in these aforementioned prohibited acts, you also hereby warrant that: you will not create multiple accounts on the Services or game the affiliate referral system of the Services by inflating your affiliate commissions; you are the actual owner of any funds which you may use to exchange for the virtual currency used within the context the Services, as well as any funds or payments which you may provide to the Services for any reason; you will not deliberately provide any false, outdated or inaccurate information to the Services; you are fully and completely responsible for ensuring the safety of your account details with the Services at all times; and when participating in wagers or contests, you are at least 18 years of age and are not prohibited from participation in the same by the laws of your jurisdiction. All users of the Services are expected to respect the integrity and the online goodwill of the Company in its actions at all times. All users are also expected to comply absolutely with the terms and conditions outlined in this Agreement, as well as any relevant laws of their applicable jurisdiction. Should the Company be exposed to any form of liability, either directly or in the form of threatened liability as a result of or in connection with the actions of you, as a user of the Services, you hereby agree to indemnify the Company entirely from such actions and to pay all costs associated with any notice, defense, trial or litigation in connection with and proceedings or otherwise which may arise from your actions. The Services and the Company shall not be liable to any user or third party for any claims, liability or damages which may arise as a result of or in connection with, either directly or indirectly, your use of the Services. Should a court of relevant and competent jurisdiction declare this section to be invalid or unenforceable, you hereby agree that the liability of the Company to you shall not exceed one hundred dollars ($100) or the actual cost of your losses, whichever may be lower; user agrees that Company shall have no liability in excess of one hundred dollars ($100) in total to any party or parties arising from any event, transaction or circumstance (including any repeated events, transactions, or circumstances). No other person or party than Company will be liable to any user under any circumstances; any claim of any kind against any other person or party than Company relating in any way to the Services or Company is unconditionally released and waived by user. User acknowledges that user is obligated to take action immediately (including ceasing of action as may be applicable) to stop or mitigate any harm or damage relating to Company or the Services. Before you are permitted to use the Services or access any portion of the Services, the Company and/or the Services may require from you a user registration including but not limited to the task of providing your personal information. Before you are able to use any aspect of the Services of the Company, it may be required of you to register an account. During registration of your account information may be collected from you including but not limited to your specific information, including, but not limited to your name, nickname, email address, identification/photo, and any other information which the Services and the Company may ask for or require. During the registration process, you agree that you will only submit accurate and relevant information. If there is a change in your information, you hereby agree that you will update your information with appropriately so that the Company and the Services possess the most accurate information at all times. Some of the information that may be asked of you includes, but is not limited to, your full name, a username, a valid email address, your address, your payment and/or credit card details and any other information which the Company may require or deem appropriate to ask. You agree that the responsibility of keeping your information, either sensitive or otherwise, safe is solely your responsibility. In the course of verifying your details and at the sole discretion of the Company and the Services, Company may require from you certain documents or methods of identification which we believe will help us ascertain the genuineness or accuracy of your identity, age and/or other personal information. You hereby agree to provide the Company or the Services any such required documentation upon request. You also hereby authorize the Company and the Services to use any third party companies or entities necessary to assist us with in verifying your information, and you hereby also authorize these third parties to require from you any documents which may assist them in confirming your information. Should you become aware of or recognize any unauthorized breach of your account on the Services, personal information or email account, you are hereby required to notify the Company and the Services immediately. Neither the Company nor the Services shall not be liable to you for any breach of your account. Apart from this, if your account is used in an unauthorized manner which results in liability or damages for the Company, you agree to indemnify the Company and the Services completely for any expenses incurred in connection with any such claims, fees or liabilities. The Company and the Services retain sole discretion in suspending or terminating any user’s account or registration for any reason and without the need to give any prior justification or notification to the user or any other party. This includes the right to close the virtual account of the user, and thereby induce the forfeit of any virtual entitlement held by the user, at the time of the suspension or termination. Any violation of this Agreement or violation of any laws of any jurisdiction occurring in connection with use of the Services shall constitute automatic grounds for termination or suspension of a user account. The Company, primarily for your convenience, may decide to place links on its Services, which may or may not be advertisements. The target of these links and/or advertisements, being third party sites, are not within the control of the Company or the Services and do not necessarily co-align with the policies and rules of the Company. The Company hereby disclaims any liability over any damage, liability or harm which you may encounter as a result of clicking such links and/or visiting said third party sites. Company owns and shall retain all intellectual property rights relating to the service. You hereby agree that you will respect the intellectual property of the Company and the Services at all times, which includes, but is not limited to, the patents, copyrights, trademarks and any and all content, software, information and device which can be found on the Services. Decompiling, copying or making imitations of the Services is absolutely prohibited. The Services hereby reserve the right to, in its sole discretion, establish the requirements and qualifications which must be complied with in order for a person or user to participate in any of the contests offered by the Services. In connection with such, the potential contestant must submit only accurate and relevant information at all times, and must have no history of violation of any laws or any of the terms of this Agreement. The Company and the Services reserve the right to evaluate all applications and authorize participation in any contest on a continuing basis. Correspondingly, the Company and the Services reserves the right to reject or restrict any such application in its sole discretion without recourse, financial or otherwise, at any time. Any participant in a contest is not permitted to inflate or game the system by opening or using more than one account. Participants are also not permitted to refer or compete with themselves, either directly or indirectly, in order to earn commission, virtual or otherwise, with the Services, or to win contests offered within the context of the Services. Should a user ever promote or seek to promote the Company or the Services, any such promotion should not contain matters which are defamatory, discriminatory, obscene, otherwise illegal or immoral, or which infringe upon the intellectual property rights of any third parties. Neither should any such promotion involve spam, spyware, viruses, hacking or any other similar information or act. Even if it has already approved the participation of a contestant in any contest, the Company and the Services reserve the right to unilaterally suspend or terminate any such contestant’s participation without any prior justification or notification, and may do so most especially as the result of the contestant’s decision to engage in any of the prohibited acts mentioned in this Agreement. This provision will apply to any dispute of any kind by any user (including but not limited to any beneficiary) relating in any way to Company (including any owner, affiliate, etc.) or the Services or otherwise relating to this Agreement; any dispute not otherwise resolved by negotiation will be resolved by binding arbitration between user and Company. Any dispute relating to or concerning the interpretation or enforcement of this Agreement shall be resolved in accordance with the laws of the state of Wisconsin, in the jurisdiction of the United States. Any disputes of any kind relating in any way to Company or the Services or from this Agreement not resolved by negotiation shall be commenced exclusively by arbitration in the state of Wisconsin in the jurisdiction of the United States, to the exclusion of all other forums and courts. User will be solely responsible for payment of all costs of any action commenced by User. You hereby expressly agree that the Company shall not be liable to you or any other person in any way under in any situation or scenario of any kind relating to the Services including relating to any use and/or collection of your Personal Information in any relation to the Services or otherwise relating to Company. Any use of the Services by you is without any liability to Company and without recourse to Company. Concentration Grid will never sell your information and is committed to ensuring that your private information is maintained by you in privacy; only information that you share to be made public will be made available as public information. In order to prevent unauthorized access or disclosure of information suitable physical, electronic and managerial procedures will be used. You may choose to restrict the collection or use of your information by declining to share information; once posted or shared by you the information may be accessed by others who view the website. If you believe that any information that you have shared is incorrect, please contact Concentration Grid as soon as possible at admin so that information if found to be incorrect may be corrected. This Agreement is binding on any person or entity using the Services or otherwise interacting (directly or indirectly) with Company (including but not limited to any owner or affiliate). User acknowledges and agrees to and is bound by all terms and conditions of use of Concentration Grid as set forth in this Agreement. User understands and agrees that Concentration Grid is a game/exercise. implied) as to any efficacy or function of the Concentration Grid game/exercise other than as a game/exercise. 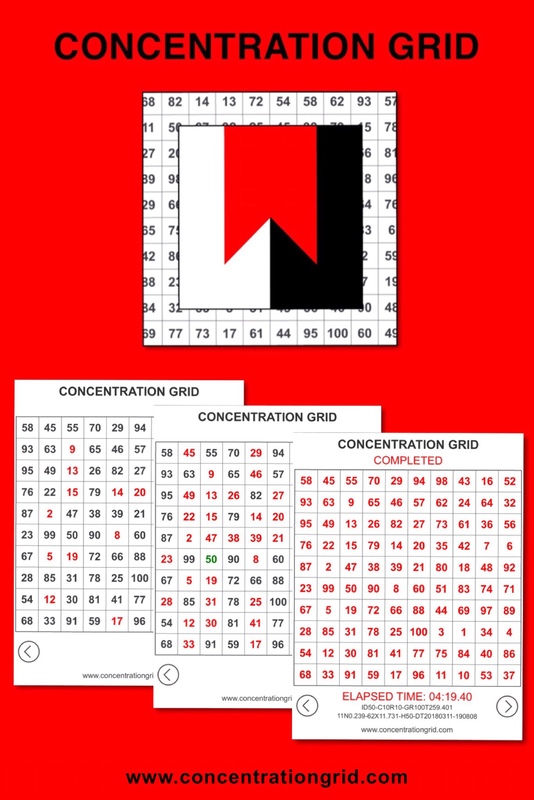 Concentration Grid is intended solely for use as a game/exercise. User is authorized only to use Concentration Grid as a game/exercise and in compliance with all other applicable laws as well as with reasonableness and proper good judgment. No other use of the Concentration Grid game/exercise is permitted. Regardless of the means of access or operation (website or app/mobile device) Concentration Grid is a game/exercise and authorized only for use as a game/exercise. Unauthorized use of Concentration Grid is expressly prohibited. Copyright 2015-2017. Stalwart Group LLC. All rights reserved.